James Bay a close to the downtown core little Peninsula surrounded by water was like so many areas in Victoria formerly used by the Indians and then by the white settlers as farm land before being further developed; it was so named after the Hudson Bay Company factor James Douglas who is considered by many to be the founder of Victoria. Douglas brought in cattle, horses and seed, and the Company's cows browsed where now the Law Courts stand. The Indians thought the cattle a conveniently docile species of deer until public whippings restrained their hunting ardour. 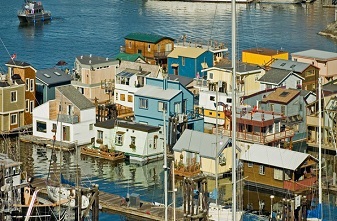 By the late 1800's James Bay had already become very popular as a residential area. There were 26 homes on Menzies Street between Bellevue and Dallas Road, most of them with large grounds. Usually there were only two houses to a block. Among residents were John A. Kerr, Wm. McDowell, Captain J. J. Irving, H. A. Rudge, Frederick Elworthy, Thomas Trounce who was responsible for Trounce Alley, Timothy Tobin, Captain D. Urquhart and Theodore Davie whose first wife was Blanche Baker of Saanich; she was only 14 when he married her. In 1970, Premier Robson's house, built in 1885 at the northwest corner of Michigan and Government Streets and next to it the house of his son-in-law and daughter Mr. and Mrs. Joseph Hunter, were being used as government offices. Robson, a compulsive talker, was the powerful boss "axeman" of politics in his time. An 800-foot long James Bay bridge (on the site of the present Causeway) was built in 1859. Maintenance seems to have been substandard: a piledriver and four men fell through the rotten planking nine years later. Before the bridge was built, passage from Government Street to the three or four houses in James Bay meant walking (in winter wading), or riding the trail skirting the mud flats where the Church of Our Lord now stands on Humboldt Street. For many years tides came right up to the Church. The old bridge from Johnson Street to the Indian Reserve was removed in 1860 thus enabling the waterfront mooring area to be extended. Many wharves went in. The first Parliament Buildings were put up in this period. They have remained an economic mainstay of Victoria ever since. 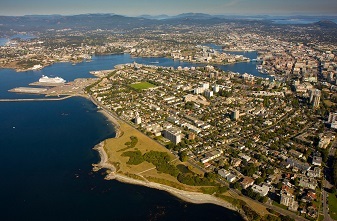 Today, James Bay is one of the most coveted residential areas of Victoria due mainly to it's close proximity to the downtown core, Beacon Hill Park, the Dallas waterfront, amenities like Fisherman's Wharf that is also a major tourist draw, and the many conveniences and attractions this area has to offer. 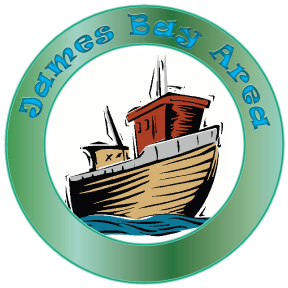 Housing in James bay tends to be of an older character type on smaller lots but of a lower quality and maintenance standard than what you might find in Oak Bay or even Fairfield mixed with low rise and high rise multi family rental and condominium buildings. The demographics consist of a more liberal and somewhat eclectic mix of provincial government employees, retirees, artists, and professional.